6. The cartoons must be sent at the e-mail address: competition@muzeulbucovinei.ro and they must be of 300 dpi resolution, A4 format, realized in any technique: black and white or coloured. 7. All the events of the exhibition will be published in the web page of the Bucovina Museum and also on the webpages of the partners. All the artists who will qualify for the exhibition will receive the printed catalogue containing all the selected cartoons. 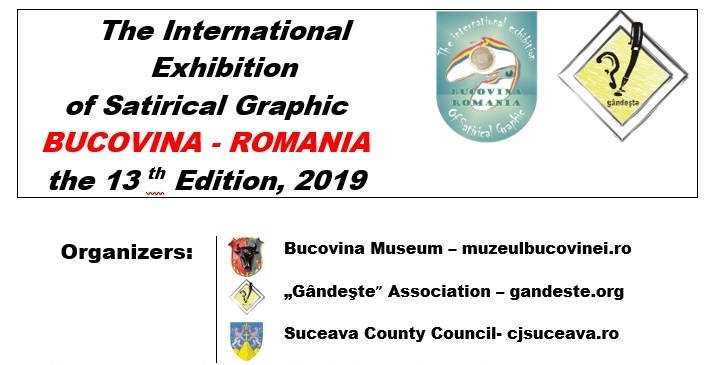 0 Response to "The 13th International Exhibition of Satirical Graphic BUCOVINA – ROMANIA 2019"